Wild Ways © 2003 Aristocrat. 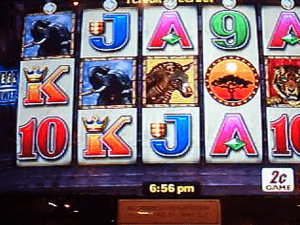 A video slot machine with 5 reels incorporating the 'Reel Power' system. Runs on the Aristocrat MKVI hardware. Any reels not specified pay on centre line only. For instance "Reels 1-3" selects the first 3 reels and the last two pay in the centre line only. 1, 2, 10 and 20 credit buttons are also used for Heart, Diamond, Club and Spade gamble respectively. This gamble is x4 if correct. 1 and 1-5 reel buttons are used for red/black double up. Wild Ways was released in February 2003.